Everything tastes better when you put an egg on it. Put a softly poached egg on spicy chicken miso soup, and turn dinner from ho-hum into ho-ho. 1. To make the soup, combine the stock or water, dashi powder, mirin, two tablespoons of soy, onion and carrot, and simmer gently for 10 minutes or until the carrot is tender. 2. In a small bowl, mix the miso paste with a ladleful of the soup broth, stirring, then return to the soup in the pan. Add the kale and simmer for three minutes. 3. To make the spicy chicken mince, heat the oil in a wok or frypan and fry the ginger, garlic and chicken, breaking up any lumps, until browned. Stir in the chilli bean paste and oyster sauce. Mix the cornflour with remaining soy sauce and add, stirring. Simmer for five minutes until saucy but still thick. 4. Divide the soup between four soup or pasta bowls, and add a good spoonful of spicy mince. 5. 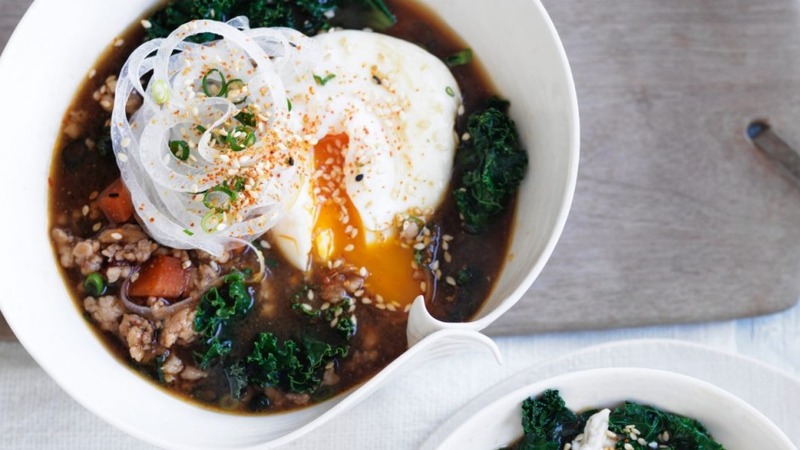 Top each soup with a poached egg, scatter with spring onions and sesame seeds and serve hot.